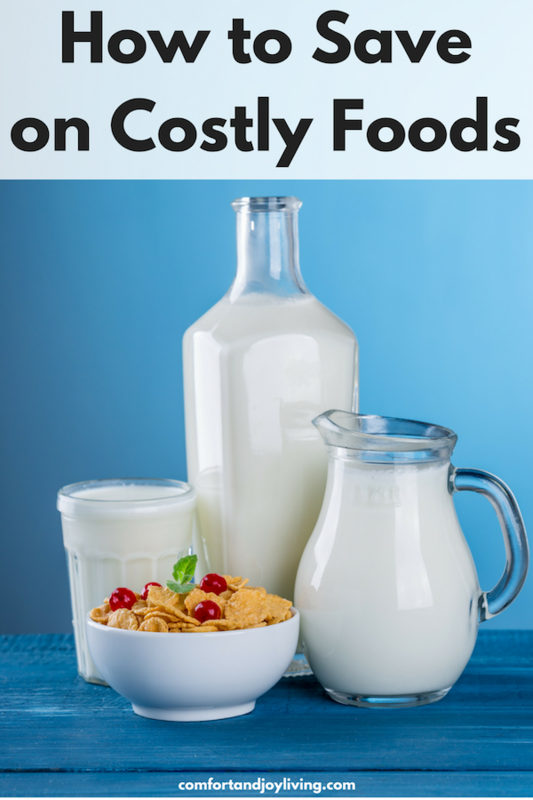 There are certain foods that can really cut into your grocery budget. Here is a list of expensive grocery staples and how you can save on them. • Milk. It’s so easy to spend prices upwards of at least $3, $4 or even $5 for a gallon of milk. And when you have growing children, a gallon isn’t going to last very long. I always check for sales and coupons. Another way of stretching milk is by adding some water. Also, make sure to freeze it if you’re not going to use it before it expires. • Cheese. We love cheese in our family and I’ll use cheese on top of vegetables to help the kids eat it. I never buy the packaged shredded cheese. I’ll buy the cheese blocks when they’re on sale and shred it myself. You can also freeze it so it lasts longer. • Fruit and Vegetables. It’s important to consume fresh produce to stay healthy, but it can get quite expensive. My first rule of thumb is to only buy produce that’s in season. Produce that’s not in season is very expensive. Another tip is to stock up on produce when it’s in season and on sale and using some right away and freezing the rest. Another way to save is by joining a CSA or Co-op. When you become a member, you receive a box of seasonal produce every week throughout the farming season. • Meat. Even when you buy it on sale or find coupons for it, meat can be quite pricey. One strategy I’ve used to save on meat is to eat less of it. We have two to three days of meatless meals and my family doesn’t even miss it on those days. I’ll make veggie or black bean burgers, pasta, vegetable casseroles, rice and veggies, etc. Another way to cut the cost of meat is by cutting pieces of it in small pieces and adding it to dishes like casseroles, stews and soups. • Pantry Items. Cereal, peanut butter, snacks like granola bars, can add up so quickly, especially when they’re staples in your family’s diet. One way I save on these items is by making my own. The extra benefit of making your own is they won’t have unhealthy ingredients.